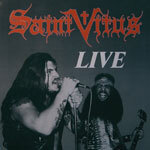 If it wasn't for Black Sabbath, it was for Saint Vitus. If it wasn't for Saint Vitus, it was probably for death. These worshipers of early and doomy heavy music were one of the leading bands of the American traditional Doom metal, much prior to its late awakening at the beginning of the 90's as a contemplative slow growling-based metal. Saint Vitus were the original death alright, and they were slow, much tooooo slow to some people's ears, and to top it all, they were a seriously secret band. Thanks to the "Stoner" mini revival of heavy rock at the mid/late 90's, Saint Vitus are gaining more and more listeners that are following the yellow brick road of doom. This live album was recorded at Germany's Circus Gammeldorf in 1989, released on vinyl in 1990, and last year by our lord the southern on CD. It contains Saint Vitus classics such as the crushing "Born Too Late", the addictive "Dying Inside" and the slowly galloping "War is Our Destiny", plus three tracks that weren't available on the original release: ""The War Starter," "Mystic Lady," and "Clear Windowpane". Along with the "Heavier than Thou" collection from 1991, here's a rare chance to catch 100% underground heavy music at it's best, as well as some freaky drum solos, whining Tony Iommi-like guitars and lazy as hell bass lines. Doom sure lives!